Oh, I’m dropping Simoun, because the sub’s ... well slow and I think I lost interest in it already, but I’ll be watching it, so if an Ep really caught my eye, I’ll do some random postings. 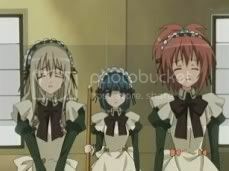 Anyways, I’m going crazy for Strawberry Panic! ... and probably doing future manga chapter reviews XD Yay! For now, here’s Ep5. 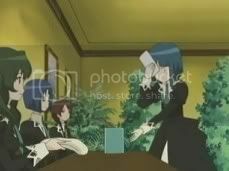 I realized the power of Mandarin these days lol, translating and watching Strawberry Panic! in Mandarin made me took out the Mandarin dictionary more often than I did when I was in secondary XD. Now it’s on a permanent spot among my messy desk. 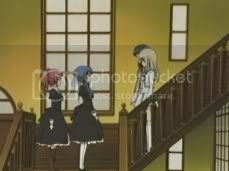 I think I’m going to watch Mandarin version of Strawberry Panic! as of now, it’s fast, I could get it probably on Monday or Tuesday. Besides, the fun thing was that I could sing out the Mandarin words while keeping on the tempo of the song~ so cool lol. Oh well, on with it. St Miator has a tradition, which was that the juniors [First Graders] get to help out the seniors such as cleaning their rooms and stuff. So seniors would have to write their names on a piece on paper before placing in a box. The juniors would then draw lots and whoever get the seniors’ name on the card would need to help them out. 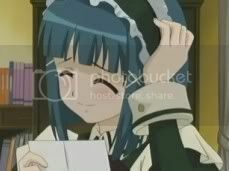 In this case, Nagisa and Tamao were decorating their piece of paper and putting in the box. A while later, the first graders lined up to draw lots and the one who got Nagisa and Tamao’s names was Chiyo. Chiyo was looking nervous and desperately hoping to draw her Nagisa Onee-sama name lol. When she got it, she sighed in relief but probably got so nervous that when Rokujou-kaichou congratulated her that she slammed against the table when she tried to bow LOL! [I think I repeated that 5 times] That night, Chiyo in her maid dress was in her room rehearsing to herself on how to greet Nagisa and probably didn’t get it right till the next day. Nagisa began to wonder why the junior didn’t come and thought maybe because the junior didn’t like their card. Chiyo finally walked towards Nagisa and Tamao’s room but they were already walking down the stairs and didn’t see Chiyo passing by. Nagisa saw the other juniors helping the seniors carrying her bag, couldn’t help but envy them that they have kawaii [Cute] juniors to help them. Chiyo knocked Nagisa and Tamao’s door but noone answered, so Chiyo turned the knob, found it unlocked and went in herself. Meanwhile, Tamao was musing over that it would be nice to see Nagisa in an apron. 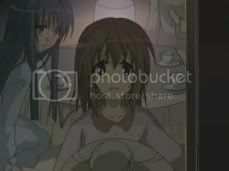 Yaya happened to be saying the same things when coming down the stairs too, but Yaya wanted to see Hikari in an apron XD. The two pairs met on the stairs and became good friends. As they were chatting about the kawaii first graders, Yaya commented that their first graders … Yaya didn’t get to finish her sentence as St Spica First Grader, Okuwara Tsubomi who was a newcomer in the choir rebuked on Yaya’s obvious comment on her. Yaya teased Tsubomi further by saying that Tsubomi had joined the choir because of Hikari lol. No doubt there’s some tension between Yaya and Tsubomi lol, kawaii~. Nagisa tried to smooth the tension by inviting them to their room to have a taste of Tamao’s delicious tea and at the same time wait for the junior who was coming and probably borrow the apron from her for dress up fun. Tsubomi got excited and squealed that she would like to see Hikari in an apron too lol, but she quickly calmed herself down and gave this, well, if you say so. Yaya ended the conversation by murmuring that Tsubomi’s such an untruthful child lol. On the other hand, Chiyo had already cleaned up Nagisa and Tamao’s room and was planning to wait for them to come back but accidentally messed up the room again when she heard a click on the door. The girls outside the door heard the noise and cautiously walked in. Nagisa saw the card she and Tamao had wrote before on the floor and picked it up. As she picked it up, the dark figure covered by the blanket rose up, scaring the wits outta Nagisa as she ran out of the room screaming and knocking into the old maid uh I mean the Sister. [The Sister was the one who lectured Nagisa for being late for the curfew in Ep1] The dark figure turned out to be Chiyo duh, so both girls got lectured by the Sister. 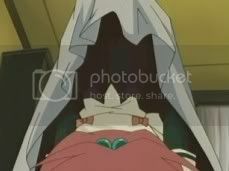 Chiyo tried to carry a ladder up by herself and refused Nagisa’s help, suddenly Chiyo tripped and fell down the stairs. As a result, Nagisa got a cut on her knee, so Chiyo used her handkerchief to stop the bleeding. 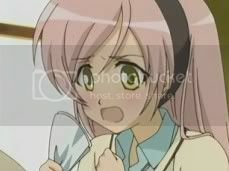 Chiyo began crying because she tried to help Nagisa but in the end always bring trouble to her. Not only that, she always wanted to be a useful imouto [little sister] to her. Nagisa returned the card she and Tamao made to Chiyo and revealed that at first she was worried that the junior might not like the card she made. However, now she’s really glad that Chiyo treasured it so much and happy that she had such a kawaii imouto. Touched, Chiyo burst into tears lol. 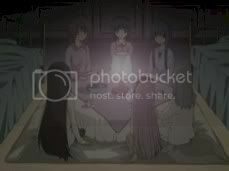 That night, the sister came to Nagisa and Tamao’s room to check if they’re asleep and everything seems fine. After the sister left, the six girls who were hiding in the bed came out to start their midnight tea party lol. Alright, now to slack aha, I’m such a slacker, been sitting at home, eating, sleep and watching TV for a month or so, maybe I should take my driving license test soon. Hm, I better start work on the doujinshis heh.